CaesarsCasino.com was greenlighted to offer Internet gambling in New Jersey on Thursday, November 21, 2103 through a round of license approvals by the New Jersey Division of Gaming Enforcement (DGE). Owned and operated by casino giant Caesars Interactive Entertainment Inc. (CIE), (the online arm of Caesars Entertainment Corporation), CaesarsCasino.com makes their online offering available to New Jersey visitors and residents over the age of 21 utilizing the Amaya Gaming online casino software platform. To play on CaesarsCasino.com, you must be physically within the State of New Jersey. Amaya, the parent company to online poker’s largest sites Poker Stars and Full Tilt, is a leading provider of online casino games and software to the regulated iGaming industry. BetfairCasino.com in New Jersey also uses the Amaya Gaming Platform. CaesarsCasino.com’s land-based casino partner in New Jersey, as you might guess, is Caesars Atlantic City, which has a rich, 35-year history of being one of Atlantic City’s most popular casinos. Given CaesersCasino.com’s ownership and licensed casino business in New Jersey, you can feel completely comfortable about your money being safe, and that their online casino is just as legitimate and well-regarded as their brick and mortar casino properties all around the country. So, let’s check out what’s happening at CaesarsCasino.com. What games do they offer? How do they stack up against the competition? And do they live up to the hype created by Caesars casino properties? The Caesars brand prides itself on brand superiority, customer service and industry-leading technology. Caesars also has made their online casino experience available to everyone, regardless of how much money you have. No need to be threatened by out of reach cash requirements, as the minimum deposit amount is only $25, and bets can be placed for as low as $0.10. Caesars even offers a completely free trial without requiring any deposit at all, where their “Fun Mode” allows you to play $500 in test credits before putting up any real money. Once your account is created and you have deposited your funds, all that’s left is for you to choose what you want to play in their wide selection of Slots, video poker, popular casino table games like Blackjack and Roulette, and several other games. 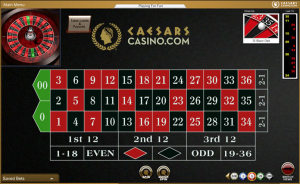 Caesars Online Casino boasts a total games inventory (as of August 2014) of 80 different games: 51 Slots, 5 Blackjack, 2 Roulette, 7 other kinds of Table Games, and 15 versions of Video Poker. 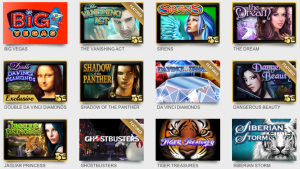 Several of the world’s most popular slot machine and casino game developers provide the broad selection of what is available at CaesarsCasino.com, including High 5 Games, the innovative ‘rising star’ of the games development arena, the stalwart of the industry IGT, plus titles developed by Cryptologic (now Amaya), in addition to others. It’s no shock to discover that CaesarsCasino.com offers a premium selection of Slots that’ll immediately have you spinning the reels in hopes of instant riches. Currently, most of the slot machines here are 5-reel video slot games, and we know you’ll be happy to hear that Progressive Jackpots are available too (more on these later)! 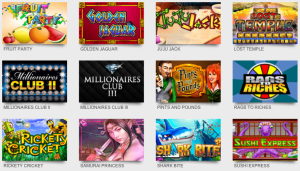 CaesarsCasino.com’s Slot offerings has grown to an impressive lineup of 51 different game titles, which is more than twice the amount of titles they offered back in April 2014. Better yet, another 17 slot titles are scheduled to be rolled out by the end of the year. Currently, you can choose from many classic and non-traditional titles, and whether it’s an underwater journey, Arabian adventure, or Olympic battle you are looking for, there’s a wide enough selection of online Slots here that are sure to satisfy. 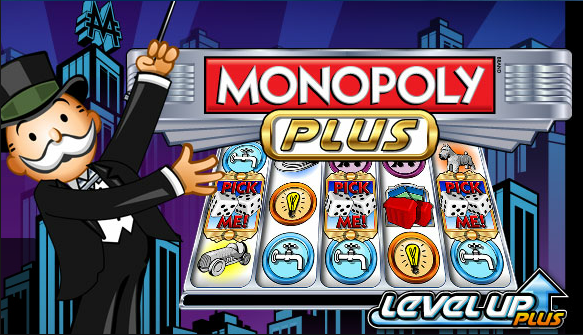 Unlock the bonus features to win free spins, earn prize multipliers, and bonus cash. Other popular titles here include Sirens, Siberian Storm, Treasures of Troy, Armadillo Artie, Kitty Glitter, Aladdin’s Legacy, and Samurai Princess. If you are a fan of the popular Double Da Vinci Diamonds title, you will be happy to know that this is one game you won’t currently find at any other New Jersey online casino, as it’s exclusive to CaesarsCasino.com. Cleopatra – Arguably the most popular 5-reel slot of all time, Cleopatra, which single-handedly set the benchmark for the “Free 15 Spins” Slot feature rounds, is now available online at CaesarsCasino.com. The ancient Egyptian themed slot has been taking regular casinos by storm for decades, and now, you can play online for real money from your computer or mobile phone! Get three or more Sphinxes anywhere on the reels to unlock the Cleopatra bonus round of 15 free spins with a 3x multiplier. 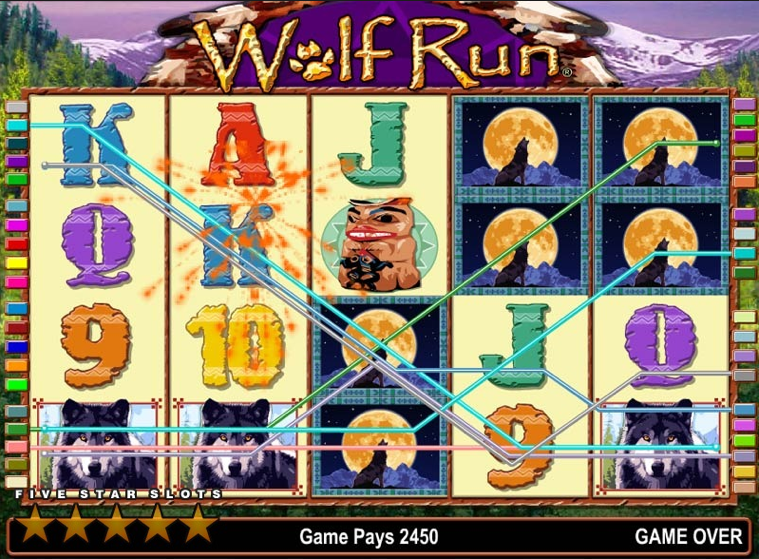 Wolf Run – Channel the spirits of the wild outdoors with the Native-American themed Wolf Run Slot game. 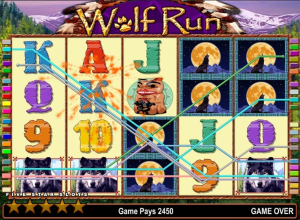 What makes IGT’s Wolf Run such a favorite amongst players is difficult to pinpoint, considering the graphics are somewhat old-fashioned by modern video game standards. 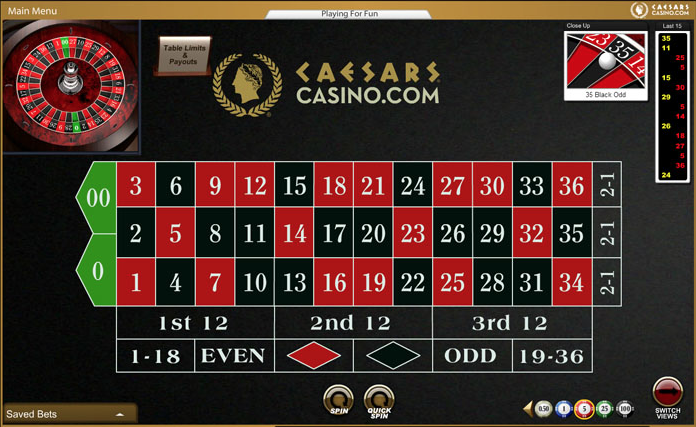 Regardless, it still remains a featured game at CaesarsCasino.com, so the gameplay is still very appealing today. It’s a 5-reel 40 pay-line game. The stacked wilds feature on every reel, and getting the Bonus symbol on reels 2, 3 and 4 simultaneously triggers the free spins feature. You get rewarded with 5 free spins, which doesn’t sound like much, but with extra stacked wilds thrown in for good measure, there’s still potential for good hits. 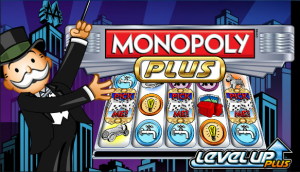 Monopoly Plus – The latest Monopoly spin-off Monopoly Plus is an IGT slot machine title that draws on everyone’s childhood memories of playing the popular board game of the same name. It’s a 5-reel 30 pay-line slot, with a Mystery Wild Feature, a huge Board Bonus feature, and a Level Up Plus feature in which you can win up to 18,000x your triggering line bet. It’s also a fairly unique feature because it allows you to collect Monopoly money each time you play, and to accumulate it over time, no matter how long it is in between sessions. This is a nice loyalty feature of Monopoly Plus, and it boasts so many features that if you play it once, there’s a high chance you’ll be lured back again. Ghostbusters – Who you gonna call? Spin, win and get slimed in the Ghostbusters online Slot game. If you’re a fan of the 80s cult classic movie, this 5-reel 30 pay-line Slot might be your lucky game! You’ll love that the Slot actually replays many great scenes and characters from the big screen. 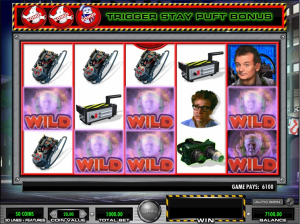 IGT, the developer of Ghostbusters slot games, was smart enough to know that a whole generation of slot players has fond memories of Slimer, the Stay Puft marshmallow man, and actor Bill Murray. 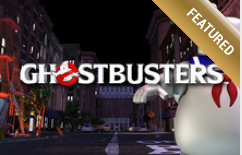 With two bonus feature rounds in the form of the Ballroom Busters Bonus and the Stay Puft Free Spins Bonus, Ghostbusters is a super-entertaining slot to play. 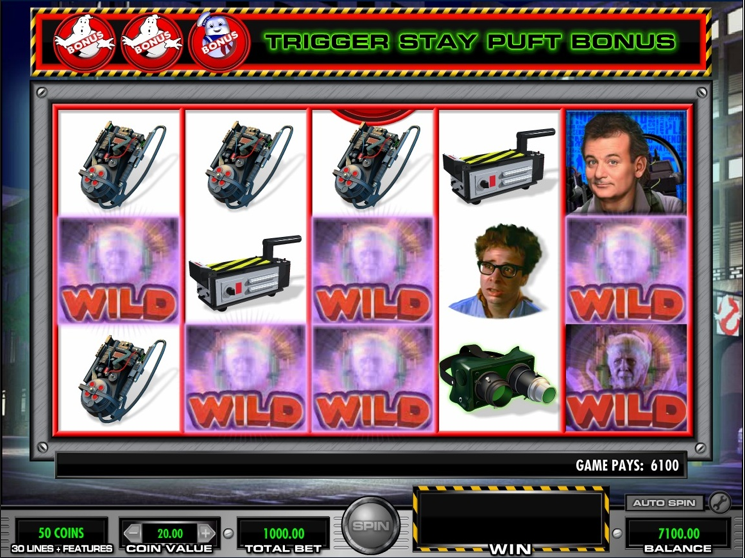 In addition to the two bonus rounds, the Ghostbusters Slot also has four features that occur throughout gameplay. These random features that can be awarded are based on Slimer, who pops up to award pay-line multipliers, extra cash and stacked wilds courtesy of turning the reels into dripping slime. The minimum bet is $1.00, with a maximum of $50.00 per pay-line, and it also offers you a shot at a jackpot of 500 coins. Rounding out Caesars other Featured games lineup is The Vanishing Act, Da Vinci Diamonds, Dangerous Beauty, and Cats. 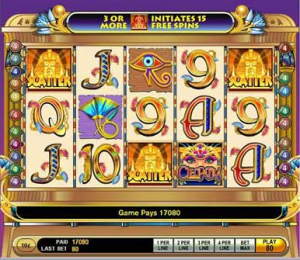 If you are interested in a possible 5-, 6-, and even 7-figure payout, then progressive slot machines are for you! 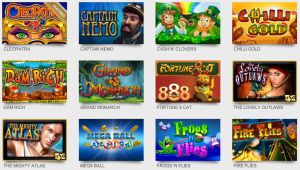 Progressive Jackpot Slots play just like most other online slots, but they have an extra prize attached that increases in small amounts with every spin of the reels. It can be frequent small amounts won, while some even offer life-changing cash. Rags to Riches – The progressive jackpot can be won during the bonus feature, where you need to pick the right item on a treasure map in four exciting rounds. If you choose correctly in all four rounds, you’ll trigger the progressive jackpot, and the money is yours to keep! Millionaires Club III – Enter the bonus round in this jackpot slot where you will be presented with 100 diamonds that reveal prizes and jackpot symbols. Take you shot at becoming an instant millionaire just by spinning the jackpot wheel. Millionaires Club II – You’ve got a shot at becoming a millionaire in a single spin with this casino jackpot. Enter the bonus feature, pick the right gems and if you successfully reveal the Jackpot symbols, you’ll automatically enter the jackpot round, where the jackpot fortune is waiting to be won. Captain Nemo – This is basically another version of Millionaires Club III, but with a sub-aquatic Jules Verne-esque inspired theme and graphics. Spin a huge bonus wheel with 3 tiers. If the outer wheel stops on an arrow, the middle wheel is activated and spins automatically. If the inner wheel lands on the Jackpot symbol, you win the progressive jackpot. Each of the above Progressive Jackpots starts at $175,000 and climbs until someone wins it. Then it re-seeds at $175,000, and the whole process starts again. It isn’t unlikely for these progressives to reach and exceed the $1,000,000 in payouts too, so be sure to check them out. For jackpots that hit more frequently, check out Sushi Express, where the jackpot is usually between $1,000 and $2,000. It’s a Japanese food themed slot with a unique Pick a Plate Bonus Feature that triggers the progressive jackpot. Use your ‘noodle’ and choose dishes to win free spins. Cross your fingers, and wait to see if the final free spin shows you the money. Tako the Octopus is the Wild here, and substitutes for all regular symbols other than the Scatters. Five Wilds pays a nice 1,000-coin jackpot, which seems to crop up a lot. Caesars has one of the best table game selections of New Jersey’s online casinos. It offers the casino classics Blackjack and Roulette, and the less traditional Casino War and No-Commission Baccarat, as well as a variety of Poker derivatives: 3 Card Poker, 4 Card Poker, 6 Card Poker, Triple Action Hold’em, and Pai Gow Poker with the Fortune Sidebet. You can pick and choose from five different versions of Blackjack at Caesars, depending on your preferences and bet limits, which run from as little as $0.10 up to bets of $500. The options available are Micro-Limit Blackjack 10, Micro-Limit Blackjack 25, European Blackjack, Vegas Blackjack, and Sidebet Blackjack. Micro-Limit Blackjack 10 seems to be the most popular amongst players at Caesars, despite only paying 6:5 on Blackjack. 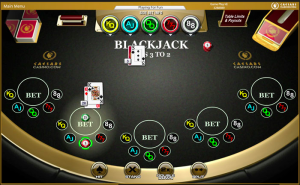 However, if you decide to give this version a run, this game does add one major benefit to offset the unfavorable Blackjack payout, with Suited Blackjack paying 2:1, plus you can also take multiple hits on Split Aces, an uncommon rule which favors the player. You’ll also benefit from 3:1 payouts on 777, and 2:1 payouts on any 5-card 21 achieved. Bet limits here are $0.10 to $10, and the Return to Player (RTP) is 99.62%. Micro-Limit Blackjack 25 is exactly the same rules as Micro-Limit Blackjack 10, except that the bet limits are $0.50 to $25. The return is also the same at 99.62%. Vegas Blackjack is likely the best option for most players, despite being 0.02% “worse” than Micro-Limit, where a lot of the return comes from the Suited Blackjacks. It has a basic $5 to $100 bet limit and a RTP of 99.60%. This version is easier to recommend, as it‘s a lot less volatile, and almost as good a return, plus you can play up to 5 hands at a time, which many players really like. 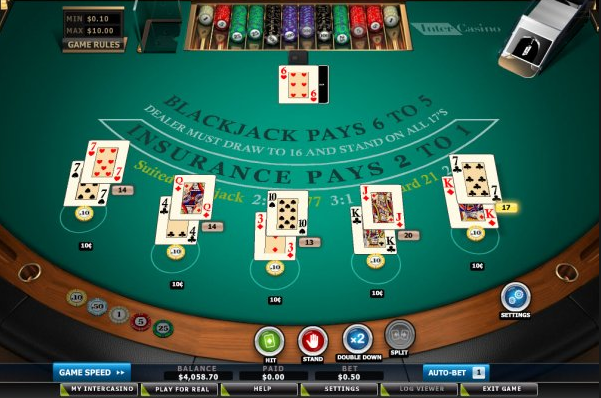 European Blackjack is a variation in which the Dealer does not take a hole card in this 8-Deck game, which means that doubles and splits are vulnerable to losing to a dealer Blackjack. This requires a different strategy to offset this. The return is 99.56%. General Rules: 8 Decks, Blackjack pays 3:2, European No Hole Card, Dealer Stands in ALL 17s, Double on 9, 10, 11 Only, Double After Split, Split Once, Early Surrender except versus Ace, No Splitting of 4s, 5s, or Tens. 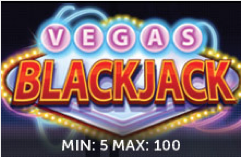 Sidebet Blackjack offers the opportunity to make five different sidebets: Mega Match, Blackjack Attack, Cash Queens, Crazy Sevens, and Pair Play. These sidebets have a higher house edge than the base game, which returns 99.54%. General Rules: 6 Decks, Blackjack pays 3:2, Dealer Stands in ALL 17s, Double Any 2 Cards, Double After Split, Split Once. The Roulette wheel evokes images of Bond-style elegance and glamour, and it’s still a popular port of call for most casino lovers. Online Roulette can also deliver some of the thrill and excitement that comes from putting your money down on a number, and waiting anxiously to see if the little white spinning ball will fall your way on the wheel. You’ll find two versions of Roulette at Caesars Online Casino – Classic Roulette and European Roulette. The European version has a single zero wheel, and therefore a lower house edge of 2.70%, so it will probably be your preference over Classic Roulette (7.89% house edge), which has a double-zero wheel. There’s a small selection of other less-traditional casino table games available, including No Commission Baccarat, 3 Card Poker, 4 Card Poker, 6 Card Poker, Triple Action Hold’em, and Pai Gow Poker with the Fortune Sidebet. 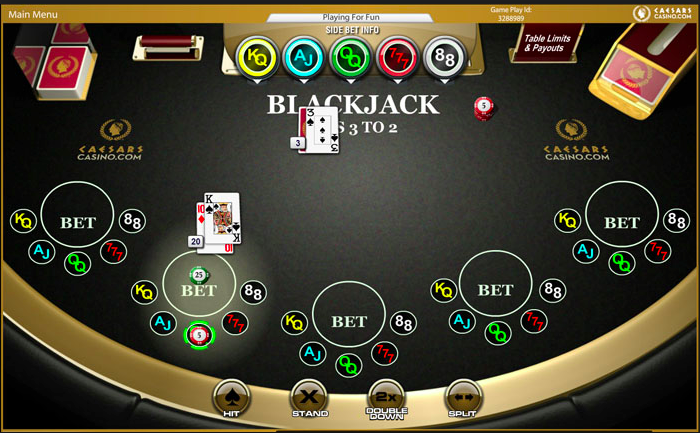 Baccarat – The only Baccarat game available at CaesarsCasino.com is a No-Commission variety. Caesars is one of the few New Jersey online casinos that offer it. It’s a simplified version of one of the world’s most popular casino games that eliminates the 5% commission charged on winning Banker bets in traditional Baccarat offered in land-based casinos. The only difference in No Commission Baccarat is the Banker bet pays only half a win (1:2) if the Banker hand wins with a total of 8. CaesarsCasino.com allows Baccarat bets of any amount between $1 and $500. 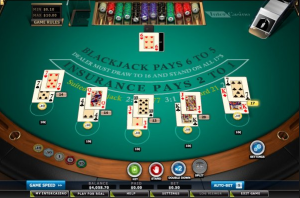 3 Card Poker – In online Three-Card Poker, the players compete against the Dealer. The objective of the game is to get a poker hand that is better than the Dealer’s. Both the Dealer and the Player get 3 cards. The Player can make a ‘Play bet’ of 1 x the Ante or Fold. In addition, there are 2 possible sidebets: Pair Plus and 6 Card Bonus. For Pair Plus, you win a payout on a Pair or better. For 6 Card Bonus, it pays out based on the best 6-card hand that is created by combining the Player’s cards and Dealer’s cards. Triple Action Texas Hold’em Poker – This thrilling game is a variation of Texas Hold’em Poker that uses only the top 28 cards of the deck. It’s a fast-paced poker game with a few different betting options. You may either bet or fold after receiving the first two cards. The Flop bet allows you to bet on the combination of 3 community cards. The Bonus Bet pays out if you have pairs or better. The Flop and Bonus Bets are still eligible to win, even if you fold. Casino War – The object of this game couldn’t be more clear-cut. Two cards are drawn at random face-up. One is yours, the other the Dealers. If your hand is a higher value than the Dealer’s, then you automatically win double your original bet. No complicated rules to master, just a straightforward bet that pits you against the Dealer. In a tie situation, you can either ‘Surrender’ or ‘Raise’. To surrender means half of the your original bet is returned and the tie is accepted. To raise means you add to your bet by doubling your ante, which will in turn see your winning also double. There’s also an option to bet on the tie, so if you correctly predict it, you’ll further boost your credits. Video Poker is the favorite game of many casino players in the USA. 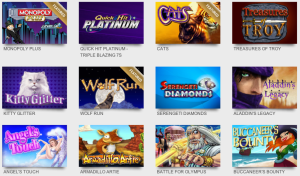 Very similar to what you would find in any Caesars land-based casino, Caesars’ online casino site has an impressive selection of 15 different Video Poker titles available. Most people love Video Poker because of their ability to impact the outcome of every game. Unlike slot machines where you just click a ‘spin’ button and hope you hit a big payout, video poker offers players the ability to choose which cards they want to hold or fold every time. Video poker is also known to have favorable odds, therefore allowing people to play for long periods of time without having to risk much money. 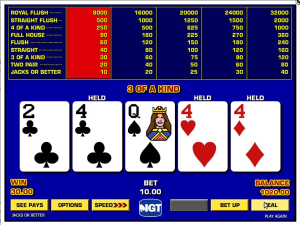 This Video Poker game is based on the Jacks or Better model, with some minor adjustments, mostly in payouts. You’ll start winning with one pair, Jacks or better, but it also incorporates a nice twist of increased payouts for a Four-of-a-Kind hand with Aces and Face cards. It’s not often you’ll see four-of-a-kind beating a straight flush, but in this game, that’s the rule! Amaya, Caesar’s software provider, follows the 8-5 Aces & Faces pay table for a return of 99.26%. 1. A free $10 Bonus (this has ‘no strings attached’ and does not require a deposit) – You’ll receive a $10 no-deposit-required bonus just for creating an account. This is only available for Slot or Video Poker play, until you have played through it once. After that, any residual balance from money you won with that $10 can be freely used to play any games that you want, or if you prefer, can also be withdrawn. It has a 1x wagering requirement. 2. 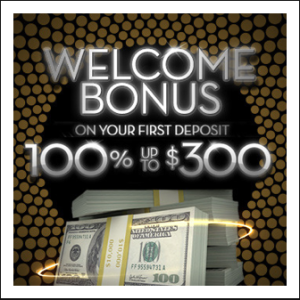 100% Deposit Bonus (this is also free money, but requires a deposit and does have some strings attached) – Your first deposit is eligible for a 100% match bonus up to $300. Wagering requirements on that bonus are 10x the deposit amount plus the bonus amount. i.e. If you deposit $100, you’ll need to make 10 x ($100 + $100) in wagers = a total of $2000. Although this might sound like a lot, it’s really not, as most people average $200-300 per hour in wagers when betting just $0.25 at a time on machines. Remember that a “wager” isn’t money won or lost, but money that you bet regardless of the outcome. So if you play a slot machine 100 times for $0.25 each time, you have wagered $25, regardless of whether you won $100, lost $20, or broke even. This Deposit Bonus calculation assumes you are playing Slots. If you play Video Poker instead, your play counts toward a lower percentage wagering requirements, so you will have to play more video poker to get the same amount of bonus money than if you play slots. Table games pay out bonus money differently than slots and machines, with consideration factors including game type, bet size, and duration of play. These bonuses are a great way to boost your bankroll, particularly if you choose to spend more time playing. If you plan to withdraw your funds after a short period of play and before you’ve achieved the wagering requirements, then consider whether you really want to accept the bonus offer. If you accept it at the start, and then change your mind, Caesars at least does allow you to opt out. You can have customer support remove any bonus money for which you have not yet met the wagering requirements. If you are a player at any Caesars-owned casinos (such as Caesars, Harrah’s, Showboat and Bally’s), you will be happy to know that the Total Rewards® program is also available at CaesarsCasino.com. If you are not familiar with Total Rewards, it is Caesars’ nationwide award-winning Loyalty Program that offers benefits and perks to frequent players. If you play for real-money at CaesarsCasino.com and you sign up for the Total Rewards® (or enter your existing Total Rewards information), you’ll receive two different types of loyalty points based on your online casino play – Tier credits and Reward credits. Tier credits determine your status in the VIP program, while Reward credits are awarded at the same rate as Tier credits, and can be exchanged for cash, merchandise, hotel accommodation and more. Seven Stars (150,000 Tier credits required). The higher your tier status, the more benefits you will receive. Get Cash Back: Reward Credits can be instantly redeemed for cash. Receive $1 for every 100 Reward Credits. Enjoy Total Rewards Casino Status: Your online play counts toward your offline Total Rewards account…just make sure you link your CaesarsCasino.com and Total Rewards accounts on their website. Your Total Rewards® membership allows you to earn Reward Credits by playing on any of Caesars’ online casino sites, as well as by playing at any land-based casino that is tied to their Total Rewards® program. Rewards Credits can be used at both online and land-based casinos. Benefits include the ability to use points for discounted room nights, dining credit, show tickets and merchandise across all Caesars properties. You’ll earn 1 credit for every $5 you wager on Slots and 1 credit for every $10 you wager on Video Poker. The amount of credits earned at Table Games may vary depending on the average bet and how long you play. You can also earn credits when you spend money on things like hotel accommodations (1 credit for every $5 spent), dining (1 credit for every $5 spent) and shopping (1 credit for every $5 spent). If you are lucky enough to reach the top tier, a lot of special perks will be offered. For example, an Invitation to their New Year’s Eve party, complimentary hotel room, annual retreat to any Total Rewards® resort or casino and much more. For a full list of benefits for Platinum, Diamond and Seven Stars members, visit CaesarsCasino.com. It is very easy to get money on and off of CaesarsCasino.com, with a number of cash, bank-wire and credit card options available. If you have heard any rumors about players not getting their money back, that was because they chose to play at an un-licensed, illegal casino. CaesarsCasino.com (and every New Jersey Online Casino listed on our site) is fully licensed, completely legal, and your funds will not disappear! When they first launched in November 2013, CaesarsCasino.com was not well reviewed for their deposit and withdrawal options. However, they have since expanded their money-in and money-out options. So, you’ll no longer have to jump through hoops to fund your account. Now you have a number of safe, secure, and simple methods for depositing money into your CaesarsCasino.com account. **Please note: If you deposit with a credit card, your card issuer may consider this a cash advance transaction; therefore, they may assess additional costs and/or fees. Check your cardholder agreement for details. It is just as easy to withdraw money from your CaesarsCasino.com account as it is to deposit money, and most of the same payment methods are available for withdrawals as deposits. If you are in Atlantic City, it is probably the most convenient for you to withdraw cash in person directly from the Cashier Cage inside of Caesars Atlantic City. Minimum Withdrawal Amount: There is a $20 minimum for both Bank Transfer (ACH) and USPS Check. There is no minimum if you withdraw at the Caesars Atlantic City casino cage. Additional information may be required to validate your bank account details before your withdrawal is processed. Caesars Casino Online does not charge any fees for any of their withdrawal options. CaesarsCasino.com is PC, Mac and mobile device compatible, on your desktop, tablet, or iPhone or Android phone. It allows you to directly login from any web browser, or you can play on their downloadable Mobile App. To get started playing on your PC, Mac, or mobile device, visit CaesarsCasino.com. Remember that before you play, you will also need to install a Geocomply plugin, which is how Caesars verifies that you are inside of New Jersey state borders. Downloading the geo-location plugin is a very simple process, so just follow the directions on their site. It should give you complete comfort to know that like all licensed New Jersey-based online gaming sites, CaesarsCasino.com is required to adhere to a strict set of regulations outlined by the New Jersey Division of Gaming Enforcement. Compliance requires that CaesarsCasino.com segregate player funds from operating accounts, and these must be held in New Jersey located bank accounts. In addition, the site must cross reference submitted registrant data across government databases for underage and invalid users, who will not be tolerated. So your money is always safe, and the games are just as policed (and even more so) as they are in any land-based casino. Additional layers of identity protection, in the form of strong authentication, are available to players who want to secure their information beyond traditional means. Caesars also provides many safeguards for problem gamblers, such as self-exclusion periods and daily, weekly and monthly monetary limits. So if you feel that you are playing too much, you can very easily prevent yourself from continuing to do so. Find out more about their Responsible Gaming Policies on the CaesarsCasino.com website. CaesarsCasino.com offers 24/7 support for any questions or issues that you may have. You can contact them via email, live chat and telephone. There is also a FAQ section, which may help you without having to contact their support. If there is one consistent theme at CaesarsCasino.com that would have to be “improvement”. They have slowly and methodically worked to improve their offering by adding new games and deposit options, and this bodes well for the future. As the New Jersey market matures, expect Caesars to remain one of the leading brands in the State. If you are playing online in New Jersey, you should register an account with them. CaesarsCasino.com offers one of the largest games selections of any of the New Jersey Online Casinos currently operating. They provide a solid cross-section of games titles, whether Slots or Table Games are your favorite form of online play, so you should be able to find more than a few reasons to register an account, and enough entertainment value to keep you playing for longer here, and more often.